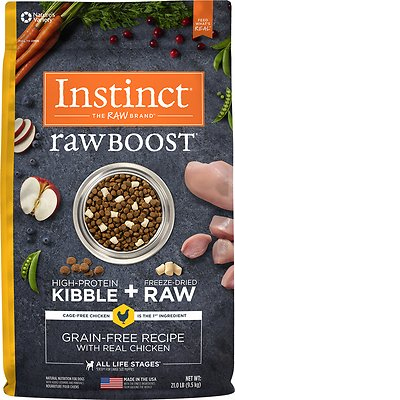 Instinct Raw Boost Grain-Free is a mid-priced dog food with great quality. This product has no controversial ingredients, including zero artificial preservatives, colors and flavors - that’s fantastic. It has very well-balanced amounts of protein, fat and carbs, with an excellent quality of meat and fat. 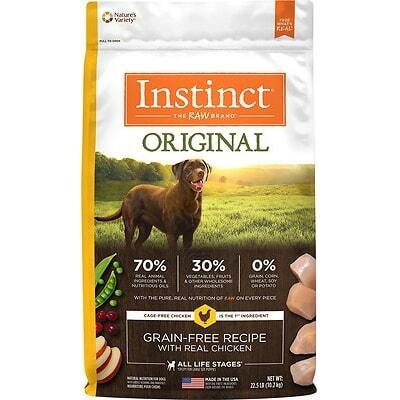 It's good to be aware that Instinct has an above-average number of dog food recalls, and the company was extremely transparent when answering our questions. Watchdog Labs recommends this product. This food has well-balanced amounts of protein, fat, and carbs. Diets that are high in protein and fat, with moderate to low carbs, are ideal for most dogs. The average dog food we reviewed has 39 total ingredients, with 1 controversial ingredient. This product has fantastic 0 total controversial ingredients. Awesome! Dog food ingredients are listed in descending order of weight. So when looking at dog food label, take a close look at the first 5 ingredients. They make up about 80% of the total weight. Chicken is a nutritious meat that provides protein, fat and other nutrients to dogs. Raw meat contains about 75% water which is cooked off during the making of dog food. This leaves only a fraction of the protein content in the final product's weight. We recommend looking for dog foods that also include meat meals in the first five ingredients (pre-cooked meat powder that contains four times the amount of protein). However, chicken is generally a healthy dog food ingredient. Meat meals are the result of cooking. Water is removed from meats to create a protein-rich meal powder. Meat meals contain about four times the protein meats do, so generally, they're a good source of nutrients. Meat meals are the result of cooking. Water is removed from meats to create a protein-rich meal powder. Meat meals contain about four times the protein meats do, so generally, they're a good source of nutrients. Chicken meal is generally a healthy dog food ingredient. Peas are a good source of carbs, fiber and protein. Peas are starchy but high in vitamin A, vitamin B6, vitamin C, vitamin K, phosphorus, magnesium, copper, iron, and zinc. We consider this a healthy dog food ingredient. The U.S. Food and Drug Administration (FDA) has warned that there is a potential link between peas and canine heart disease. It is still too early to draw conclusions so we cannot yet say if peas are a generally high-quality dog food ingredient or should be avoided. Chickpeas (also called garbanzo beans) are a legume that provides nutrients such as protein, fiber, folate, iron and phosphorus. They are generally a healthy dog food ingredient. As mentioned above, this product has zero controversial ingredients. Perfect. Instinct by Nature's Variety Raw Boost Grain-Free Recipe is made in the United States. That’s an indication of quality, because the dog food laws and regulations in the USA are higher than many other countries. This food includes a lot of different named meat sources, which clearly show what specific animal they come from. That’s fantastic. Here they are: Chicken, Turkey Meal, Chicken Meal, Salmon Meal, Freeze Dried Chicken, Menhaden Fish Meal, Freeze Dried Chicken Liver and Freeze Dried Chicken Heart. The fat in the food comes from the included meats, as well as Chicken Fat - again, it’s great that this brand identifies the species the fat comes from. 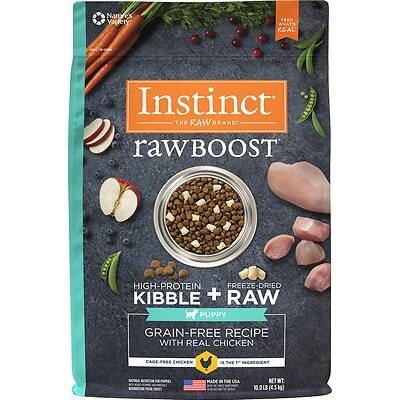 Instinct by Nature's Variety Raw Boost Grain-Free Recipe has no artificial colors. That’s how it should be! Just like for artificial preservatives and colors, this food does great for artificial flavors. That means, it doesn’t include them. Fantastic! Nature's Variety, the brand behind Instinct, has an above-average number of recalls. Take a look right below to see details on recent recalls. Nature's Variety Instinct Raw Chicken Formula Bites Nutrition for Dogs, packaged in 4 lb. plastic bags Net Wt. 4.0 LB (1.8 kg), UPC 7 6994961143 1, 6 (4 lb. bags) per case (UPC 7 69949 71143 8) and 7 lb. plastic bags Net Wt. 7.0 LB (3.2 kg), UPC 7 69949 61144 8, 4 (7 lb. bags) per case (UPC 7 69949 71144 5) . The responsible firm name on the label is Nature's Variety, Saint Louis, MO 63146. Nature's Variety Instinct Raw Chicken Formula Patties Nutrition for Dogs, packaged in 6 lb. plastic bags Net Wt. 6.0 LB (2.7 kg), UPC 7 6994961148 6, 6 (6 lb. bags) per case (UPC 7 69949 71148 3). The responsible firm name on the label is Nature's Variety, Saint Louis, MO 63146. Nature's Variety Instinct raw, Organic Chicken Formula patties, packaged in 6-lb bags and packaged in 6/6-lb bag/cases. Nature's Variety Instinct raw, Organic Chicken Formula medallions, packaged in 3-lb bags and packaged 9/3-lb bags/case. The products may contain hard plastic pieces. 3 lb. chicken medallions, 6 lb. chicken patties, 2 lb. chicken chubs with a “Best By” date of Nov. 10, 2010. Instinct answered in two days with a great response. Fully answered with no follow-up emails required. All questions were fully answered with no follow-up emails required. There were few companies that answered this clearly and quickly. We do have multiple Nutritionists with PhDs on staff, however, the formulation of our diets is a collaborative effort between our Nutrition Council composed of veterinarians and our Research and Development Team. The doctors on the nutrition team are: Susan G. Wynn, DVM, CVA, CVCH, RH(AHG) Veterinary Nutrition and Integrative Medicine Service & Dr. Lea Stogdale, DVM, Diplomate ACVIM Holistic and Integrative Medicine and Care. It's great to see this level of transparency on the first email response. Knowing exactly who the individuals are working on the food we feed our dogs is insightful. All our products meet AAFCO requirements. Our kibble and canned foods meet AAFCO requirements for nutrition (analysis), but have not undergone feeding trials. Our raw diets have gone through feeding trials and meet AAFCO requirements for nutrition. We do a nutritional analysis on all of our complete and balanced products. Our products are all manufactured in the U.S. – kibble in Kansas through CJ Foods, cans in Kansas through Simmons, and our Instinct Raw line is manufactured in our own facility in Lincoln, Nebraska. All this detail was provided in the initial response. That’s a great sign of transparency. They are not open to the public. Pet health and safety has always been our top priority. We believe your pets – and ours – deserve nothing less than superior quality foods. With all of our products, we utilize robust systems to ensure the quality and safety of our foods. Our quality control and quality assurance programs include but are not limited to: Sanitation Standard Operating Procedures (SSOP’s), Good Manufacturing Practices (GMP’s), A Hazard Analysis & Critical Control Points (HACCP) Program, Lot Segregation, other human food industry best practices, and High Pressure Processing (HPP). At every point in the process – from raw material receiving to finished product – there are quality steps and checkpoints. Raw materials and finished products are routinely tested. The manufacturing plant and any warehouses where the product is stored are also inspected on a routine basis. We are confident that we produce high quality, safe products. Please be assured, Nature's Variety has and will continue to enforce only the strictest quality standards in the pet food industry. Previous answer covers this. They have their own facility in Lincoln Nebraska, and work with CJ Foods as well as Simmons. We take every step to source non-China ingredients where we can. We do not source any of our meat, poultry or fish from China. Our raw frozen diets are also not made with any ingredients from China. Our kibble diets may contain minor ingredients (vitamins, trace nutrients) sourced from China to ensure supply is guaranteed. Our approved supplier has put in measures to assure food safety and traceability from a trusted supply chain.